It's that time of the year when Freeform is playing Halloween movies all day long for the month of October. Don't get me wrong, I love some good Halloween movies, but Disney Halloween movies I watched as a kid beats any scary "Halloween horror" movies there is out now. I mean, I was scared to leave my house after Hocus Pocus and see vacuums in the sky, to being scared my mom was going to go on a date and be taken by a Vampire. I feel like watching Disney movies from my childhood makes me feel young but also old at the same time. I hope you love Disney Halloween movies as much as I do. Here are my top 10 Halloween movies growing up. One of Kirsten Dusts greatest rolls in her teen years, and I had the biggest crush on Steve Guttenberg...who knew! I thought this movie was super cool and suspenseful. I was scared of looking under my bed in general. If I dropped a stuffed animal under my bed I'd make my brother grab it for me WITH the lights on. This movie? Didn't help my problem. This was the first time I fell in love with actress Caroline Rhea before Sabrina the Teenage Witch. It's a shame that man was a vampire because he looked good in a suit. Yet we all knew he was too good to be true. This is the one when three 12 year olds accidentally bring a two thousand year old mummy back to life. I mean, what could go wrong? A lot. All I can say is the second isn't as good as the first...that just might be my opinion but I'm just saying. After the success after the first Halloweentown, I wasn't surprised they got a second movie! I never trusted that boy Kal, and especially his father Kalabar. I feel like Halloweentown II did not disappoint even though Gort's house stresses me the heck out every time I watch those scenes. 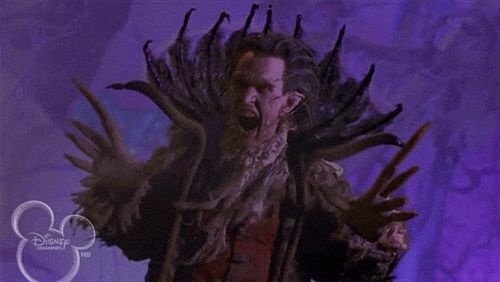 I remember the first time I watched Halloweentown and I thought the taxi driver Benny was the funniest thing! I feel like I don't have to explain this film because I hope when you think of Halloweentown you think of Benny and the giant Pumpkin the middle of town! Halloweentown 3 didn't make the list or Halloweentown 4. I mean Halloweentown 4 I'm still mad about. I mean, you can't replace the leading lady with a whole other person and think us kids aren't going to notice? !